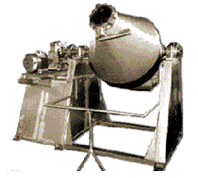 This type of machine has the most efficient design for rapid blending and mixing at low operating speeds.The design consists of shallow vertical cylinder with a cone of carefully engineered angle located at each end.Products mixed can be dicharged directly into the container if desired by means of a butterfly valve fitted at the end of the cone. The blender is available either in M.S. Or S.S 304 / 316 materials. The drive consists of a motor coupled to a suitable gearbox to give the desired RPM.